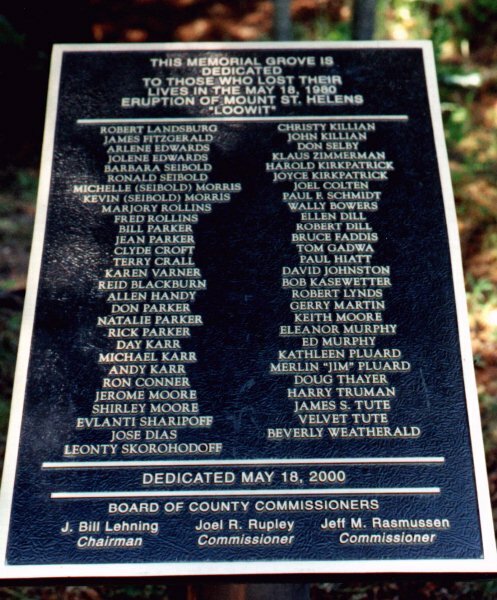 In May of 2000, a memorial plaque was placed in a grove of trees at the Hoffstadt Bluffs Visitor's Center in memory of the victims of the eruption. Fifty-seven names are etched into the plaque. Fifty-seven lives needlessly lost. They were loggers, campers, reporters and scientists. In all, there were 36 victims brought out of the devastated area. But after all of the searching, rescues and recoveries, there were still many people who were never found. By the third week following the blast, 25 people were confirmed dead but 47 were still on the missing list. Luckily, 15 of the missing were later found alive. Only four of the victims were known to be inside the restricted areas set up by federal and local governments. David Johnston was on duty for the USGS stationed at Coldwater II only 5 miles from the summit. There was the stubborn Harry Truman who refused to leave his lodge at Spirit Lake and was eventually given special permission to stay. And amateur vulcanologists Bob Kaseweter and Beverly Wetherald who had permission to take readings near Spirit Lake at their own risk. The other victims, some as far as 13 miles from the mountain, were in areas considered safe. The thick clouds of ash and raging mudflows caught many people off guard. But even to this day, controversy bubbles just beneath the surface. It is well known that local government was pressured by logging companies to make the restricted areas smaller than recommended by the USGS. Millions of dollars in revenue were going to be lost if loggers could not get in to retrieve lumber. Even locals living near the mountain balked at the limited access they had to their property. In the weeks before the eruption on May 18th, the mountain had become unusually quiet and many people believed the danger had past. They were tired of the disruption to their lives and wanted the blockades removed. In hindsight, many more people would have survived had the federal and local government heeded the warnings of David Johnston and the other USGS officials and made the restricted zones larger. For some, luck was on their side. Had the mountain erupted only a few hours later, the forests surrounding the area would have been filled with the sounds of chainsaws run by the thousands of Weyerhauser employees usually at work near the mountain on weekends. Unfortunately, we may never know if there were other victims who chose the wrong day to stray too close to the mountain and were never counted as victims. At least one survivor who had been camped just outside the restricted area told rescuers that he had seen people on the ridge below, inside the restricted area, just before the eruption. Who were these people? Did anyone even know they were there? In the book Mount St Helens: The Eruption and Recovery of a Volcano by Rob Carson, Skamania County Sheriff William Closner states, "People went over, under, through, and around every time we tried to restrict access to what we believed were dangerous areas. There were even maps sold showing how to get around our blockades on the mountain." Because of the severity of the devastation near the mountain it may never be known if 57 is the final tally. Below is a list of the known victims of the eruption. I would be interested in adding some personal information for each victim if anyone can be helpful with this task. Reid, age 27 (b. August 1952), was a photographer for The Columbian newspaper who was donating his time to the U.S. Geological Survey and National Geographic magazine at the time of the eruption. He was camped at Coldwater I, seven miles from the mountain. b. August 7, 1936 in Indiana (age 45) He was a port engineer for Kaiser Aluminum and Chemical Inc.
Ronald left a family of 4 daughters, Sherrill, Theresa, Patrica and Rosa. His son, Ronald Jr. was killed in an auto accident in Magee, Mississippi. He was survived by his mother and father Charles L and Bertha L Conner, Brothers Marvin and Leslie Conner all of Auburndale, Florida, two brothers from Muncie, Indiana, Glenn and Charles A Conner. He was a native of Muncie, Indiana going to several schools there. Ronald was a member of the US Army for eight years where he served in Germany, Italy, and in Korea during that conflict. He married in Italy and along with his wife, Franca, moved to Washington state where he was employed with Reynolds Aluminum Co. He enjoyed the outdoors, scuba diving and family. b. December 14, 1942 in Texas (age 37). He was a grocery warehouseman. Jim and I attended the University of Akron together; graduating in 1970, and were both commissioned as Second Lieutenants in the United States Air Force through the AFROTC program. Jim earned a B.S. in geology, went on to get his M.S. from University of Idaho, and was working on his Ph.D. in Vulcanology at the time of his death. I found the following on the Alumni News site from the U. of A.- "The James F. Fitzgerald, Jr., Memorial Scholarship Fund Established in 1980 by family and friends, this endowed scholarship honors the memory of James F. Fitzgerald, Jr., of Canton, Ohio, a 1970 geology graduate who was killed during the eruption of the Mount St. Helens volcano. He was engaged in field work for his doctoral dissertation as a graduate student at the University of Idaho at the time of the tragedy. This endowed scholarship is awarded to an outstanding geology senior selected by the faculty of the Department of Geology. Memorial contributions are welcomed." Christy Liann Killian Vader, WA, camping with her husband, John (see below), at Fawn Lake. They had only been married for 7 months. Christy was a graduate of Toledo High School. b. November 26th and November 1st, 1946, respectively. Both age 33.
b. November 13, 1931, age 48, free-lance photographer. Michelle Lea Morris Olympia, WA. Kevin, age 7 and Michelle, age 9. Both were camping with their mother, Barbara and stepfather, Ronald Seibold (see below). Don and his family had a mine a few miles from the base of Mt St Helens, behind Mt. Margaret. Don was my former husband, however we were divorced and I remarried in l964. We had a son so we remained in contact over the years. I knew Don since he was 17 and I was 12. Ron was President of the Olympia branch of the Mountaineers. Thank you to Ed Barnard, Ron's friend and Mount St Helens climbing partner. The Seibold's are also fondly remembered by fellow Mountaineer, Bruce Tenney. Robert and his wife Ellen were on their way to the Wenatchee Apple Blossom Festival in their motor home. Robert was born in Cosmoplis and knew the area very well, having hunted and fished around Mt St Helens all his life. They were stopping to take pictures of the mountain before heading to Wenatchee. That is the last they were ever heard from. Robert had been in the auto service industry all his life in the Seattle area and his wife Ellen was about to retire from Boeing. Thank you to Marianne Nickell London, Ellen's daughter, and Steven Dill, Robert's son, for writing to me. Bruce was a personal friend of mine. We worked together at Black Butte Ranch Resort near Bend, Oregon as firemen. That weekend he packed up his Datsun station wagon, his Martin guitar, and himself and departed for the Mountain, never to return. He was an enthusiastic person, gregarious and loved by all for his honesty and willingness to help anybody. He was probably 20 at the time of his death. years later, some folks corresponded with me, saying that she and her husband were among official people going thru the destroyed areas, and had come across a wrecked vehicle which was probably Bruce's, but nothing very identifiable remained. They said the vehicle was pointed downhill, which might have meant Bruce was trying to escape, but we'll never know. Bruce Faddis was my roommate in college. Yes the Martin guitar was indeed Bruce. Many times he would be in the basement of our house strumming and singing. And boy, was he a funny cowboy. I still can to this day see Bruce in my minds eye and picture him at Mt. St Helens. He lived with us in Corvallis Oregon, Bill (Mo) Beckley, Marc Watt, and Brad Johnson. Bill and Marc from Bend Oregon and Brad from Creswell Oregon... all country kids. was dedicated to Johnston's memory on May 18, 1982. Age 39, volunteer volcano watcher positioned at his cabin on Spirit Lake. Robert's sister, Connie, took one of the last photographs of Harry Truman while they were at Spirit Lake removing belongings from their cabin on May 17th. Thank you to Connie Pullen, Robert's sister, and Robert's cousin, Roxanne, for writing to me. John G. Killian Vader, WA, age 29. Camping with his wife (see above) at Fawn Lake. The two had only been married for 7 months. John was a graduate of Toledo High School. Robert was, at one time, a boyfriend of mine. He was one of the nicest people I have ever known in my life. He was in his early twenties when the mountain took his life. He was tall, thin and had long brown hair and the prettiest green eyes. I used to tease him about his eyes and he would blush every time. Those of us who knew him will remember him as a real quiet but outgoing guy. He was where he wanted to be at his untimely death. None of us ever dreamt that his life would end this way. He was no where near the red zone and it shocked us to hear of his tragedy. He touched my life and I will always remember him. I didn't know him extremely well, no one really did. He was shy and kept to himself quite a bit. But he was a real sweet heart. Very soft spoken, polite and always had a shy smile for us. He decided to go camping with his new girlfriend who most of us had not met. I don't remember Robert ever having a girlfriend before and he seemed really smitten. Like many folks I think the threat of the mountain blowing was not a reality to Robert. He was a real "natures child" with shoulder length hair, a laid back manner, and just wanted to get away with his new girlfriend. He had a new happiness about him and I can only guess he had found new love. He was kind, sweet and would do anything for anyone. All of his friends were really saddened when the mountain blew that Sunday because we knew he'd gone camping and we just knew he was gone. I still feel sad when I think about today, but I know he's happy wherever he is and that he is smiling down on us. Ruth Kathleen Pluard Toledo, WA. The Pluard Memorial Picnic takes place every year in honor of their memory. Thank you to their grandson Jason for writing to me. Age 36. Born May 15, 1944, in Iron Mountain, Mich. Whereabouts unknown, but reported on sheriff's missing list after the May 18 eruption and has not been seen since. He was unemployed. Harry R. Truman Spirit Lake, WA, age 84. He was last seen about 6 p.m. May 17 at his lodge by Spirit Lake, five miles north of Mount St. Helens. After refusing to leave his lodge, he had been granted special permission to remain inside the Red Zone. His body has never been found. Harry's Ridge and the Truman Trail were named in his honor. He had run the Mount St. Helens Lodge on Spirit Lake since 1928. James S. Tute James & Velvet(ia) Tute resided in Mission, B.C., Canada. My Aunt Velvet was an artist and they were visiting Mt. St. Helens so that she could paint the volcano. They went down to the volcano with their dog and in their Volkswagen van. We understand that they, their van, and dog were never recovered. My Aunt Velvet was a free spirit - always interested in the gentler things in life - like flowers, nature, art, & yoga. Painting was her passion. My uncle worked on the tugs in our B.C. waters. They had two sons - Brock and Darryl. Aside from the sons, James Tute was survived by his brother Charlie Tute of Langley, B.C., sister Mary Thompson of Vancouver, B.C., and sister Dorothy Sloan of Saltspring Island, B.C. Thank you to their nephew Tony for writing to me with this information. Age 35, volunteer volcano watcher positioned near Spirit Lake with her boyfriend, Robert Kaseweter. It just seemed sad to me that so little was known or written about Beverly. I didn't stay in contact with her after high school, so I don't know what her life was like those next 17 or so years. She was my neighbor in the next block in Richland. We grew up together, going through Sacajawea Grade School, Carmichael Junior High, and Richland High School, and we'd study together in junior and high school, at each others homes. She was very quiet, - rather shy - and I remember her mom was a nurse and told me (because I had plans to enter nursing school), that I would have to memorize every bone in the body. Beverly and her family (sister and parents) took me to their cabin somewhere on a lake for a weekend, but I don't remember the name of the lake. Bev and I had the time of our lives, because there was a handsome young man around, who took us on an exciting boat ride during a storm (a dumb and dangerous thing to do, but we were immortal, remember). I considered her a sweet, kind friend. Thank you to the USGS and other featured photographers. Without the photos, these pages would not be possible. This page last updated June 06, 2006.